There’s nothing like the magic of a letter from Santa to light up every child’s face this Christmas. A personal letter from Santa will add even more joy and laughter to the happy day. Together with his little helpers, Santa spends months getting ready for the busy holiday season. After all, he’ll be visiting lots of girls and boys, all over the world, who have been really good all year. But he’s still got plenty of time to send out, to each and every one, that very special personal Christmas greeting. Christmas is a very special time, and we are looking for parents and grandparents to review the website www.laplandmailroom.com to help build awareness of the website in preparation for Christmas 2018. 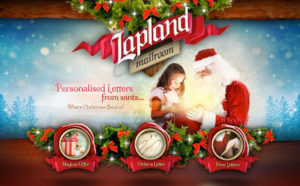 Each review/blogger who offers to help with a review of laplandmailroom.com will be sent a personalised letter in December for your child in the post which will include an activity pack and also a Personalised Good Child Certificate! We will send you a FREE letter including the activity pack and a good child certificate for your child/children. The letters are sent out the first week of December, however, we would like the website reviewed and blog published in October. Once the letters arrive it would be fantastic if you could share pictures of the product. Bringing the magic of Christmas alive once more. If you have a great idea to promote this wonderful gift please let us know we would love to hear from you. As mentioned above, whilst we have a preference for parents and grandparents style blogs we would also happily consider any which have active readers who feel the content would be relevant. We are very happy to offer exclusive promotion codes to your readers offering a discount and depending on the reach we can also a competition prize for your readers to win a personalised letter from Santa. If you are interested in prizes please ask.